Having successfully completed his basic flying training, Harold joined Number 15 Course at the RAF's No.10 Flying Training School at Ternhill, Shropshire, the course officially commencing on 9th October 1939. He was a member of a course of 39 pupils, of whom 27 were Acting Pilot Officers, 9 were Corporals, and 3, including Harold, were LA/C's. 10 of them had been at Desford together. Ternhill was one of the five new Flying Training Schools opened in 1935 as a result of the Government's decision to expand the RAF. As at all FTS's, training was based around what was known as the 'Gosport System', devised in 1918 by Major R.R. Smith-Barry. Basically, the approach was to allow the trainee pilot to be 'in the hot seat' as much as possible, even during dual flights. Thus he would learn the limitations and abilities of both the aircraft and himself from first-hand experience. In common with most RAF Training Units at the time, 10 FTS was equipped with North American 'Harvards', and the first task was to convert the new intakes from biplanes to a much faster, single-winged aircraft. Harold very quickly made the conversion, as his Log Book shows that after only 2 hours and 25 minutes instruction, he took and passed his solo test in the aircraft. 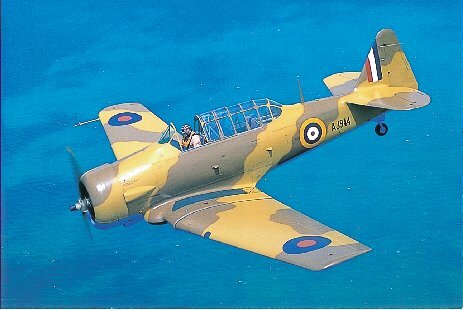 The Harvard was a fairly large plane with a wing span of 42ft and a length of 29ft. It was not particularly fast, having a maximum speed of 205 mph, but it was considerably faster than the Tiger Moth. Despite this, it could land at less than 70 mph. It was a two-seater aircraft, designed as an advanced-pilot trainer. The pilot and instructor sat one behind the other, both with a full set of instruments and controls. During his stay at Ternhill, Harold was to spend nearly 100 hours in Harvards, over 60 hours as a solo pilot. Unlike his experiences at Desford, where more than half his flying time was in one particular aircraft, Harold's Log shows that he was not attached to one single machine. He did spend 9 hours flying N7156 and a similar time in N7025, but also made at least one flight in no less than 30 other Harvards. He was, however, instructed largely by one person, as most dual flights were made with a Sgt. Hartley. Where another person was co-pilot, it was usually for the purposes of a test, such as on 11th October when F/Sgt Sweet conducted a Solo Test, or 27th November when P/O Silk conducted a Flight Commander's Test. Besides teaching advanced flying techniques to its pupils, the FTS was also concerned with such skills as Signalling, Reconnaissance, Maintenance (at which Harold scored second highest on the course), and Qualities as an Officer or NCO. In addition to practical flying, written examinations were also held in Air Navigation, Armaments, Airmanship, and Signals. No.15 Course's records show that Harold did well in most aspects of his training. For the written exams mentioned he scored 86.6% (4th overall), doing particularly well in Air Navigation. He scored 79% (3rd overall) for practical Armament and navigation skills. In his final assessment he gained 72% for his qualities as an NCO, but 87% (only 1 point behind the best pilot) for his qualities as a pilot. His passing out position was 3rd, with an overall score for the course of 81%, 3 and 1 points behind the 1st and 2nd placed men, both of whom were also NCO pilots. The first 2 hours 45 minutes were spent in dual flight practice whilst Harold became familiar with the new aircraft, and then he made his first solo flight in a monoplane. Throughout October various exercises were undertaken so that the new pilots became thoroughly competent with their aircraft. Skills practised included powered and glide landings; take-offs with and without the wind; turns; instrument flying; spinning; low level flying; forced landings; and loops and slow rolls. During the month a total of 30 hours and 35 minutes were spent flying. The month began with practice in formation flying, followed by cross-country flights to such places as Cirencester, Leominster, Hullavington, Ollerton and Peterborough, although the last flight was abandoned due to bad weather. On 9th November a new experience began - night flying. For Harold, however, it started somewhat disastrously, as during the first few landings the Harvard collided with two Ansons. Subsequently, several other landings, including some solo, went without hitch. The rest of November was spent in more flying skills practice, and cross-country flights to Wittering and South Cerney. November ended, after a further 20 hours 5 minutes flying, with a Flight Commander's Test, and Harold was graded as an 'Above Average' pilot. December saw the beginning of combat training, with 5 hours 35 minutes being spent in air-to-ground firing and low level bombing practice. Bombing practice continued, with both high and low level and dive bombing being involved. Air-to-air firing at towed targets was the next skill, and on 18th January Harold himself spent 2 hours 20 minutes towing a target. No doubt this all reminded Harold of his course at North Coates a few years previously. On January 16th a cross-country Navigation Test was undertaken, with a flight to Tewkesbury and Peterborough. The rest of the month was spent in more night flying, and also formation flying, both as a member of the formation and as the leader. The total flying time for the month was 20 hours 15 minutes. The Log Book records that no flying took place in this month due to bad weather. The last full month at Ternhill was spent on further combat practice, such as low and high level and dive bombing, and firing at ground and air targets. Much of this experience was gained at No.9 Bombing and Gunnery Practice Camp at Penrhos, North Wales. Harold arrived there on 3rd March, and the flight is recorded as one of the few in the Log Book where he was a passenger and not a pilot or co-pilot. After almost three weeks at Penrhos the return flight to Ternhill was made on 22nd March, again with Harold officially logged as a passenger. A cross-country flight was made to Peterborough and Tewkesbury again, and there were Instrument Flying and Navigation tests. The total flying time for March was 16 hours 10 minutes. The last few days at Flying Training School were spent revising flying skills, flying time for the month being 7 hours 20 minutes. Finally, on 12th April, Flight Sergeant Harold Orchard received his final grading of 'Above Average' pilot. He left FTS with a total of 151 hours 40 minutes flying recorded in his Log Book, of which 92 hours 35 minutes was as a solo pilot. This fits well with the RAF's pre-war requirement of 146 hours flying before joining a squadron.